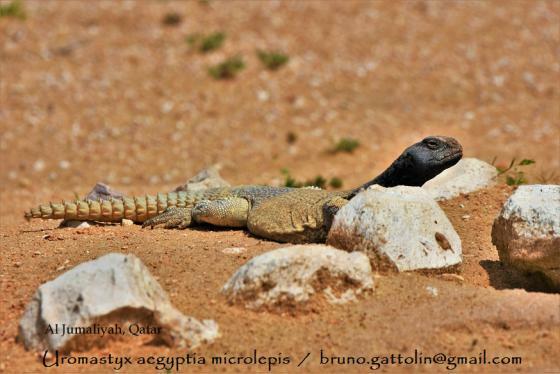 Can you confirm these amateur observations of Uromastyx aegyptia? 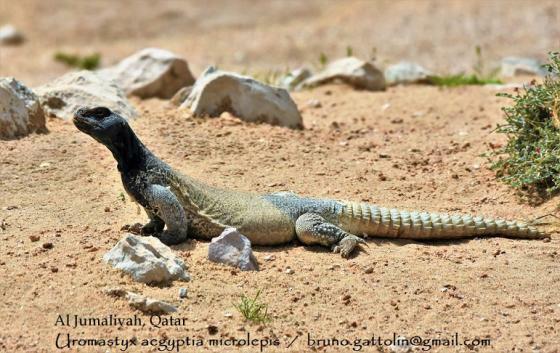 leptieni: Oman, United Arab Emirates (vicinity of Muscat in the south through the Batina coastal plain and the eastern foothills of the Hajar al-Gharbi mountains to the Musandam Peninsula in the north); Type locality: Wadi Sijii, United Arab Emirates (UAE). 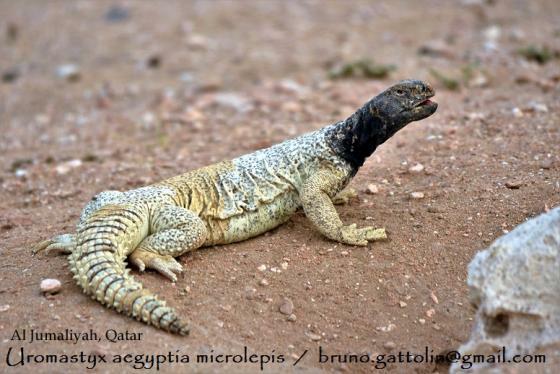 microlepis: deserts and semideserts of Arabia (Saudi Arabia, Yemen, Oman, United Arab Emirates, Qatar, Kuwait), in Jordan, Syria, Iraq and coastal Iran; Type locality: vicinity of Basrah, Iraq. Types Neotype: ZFMK 44216, and lectotype designated by Wilms & Böhme 2000. 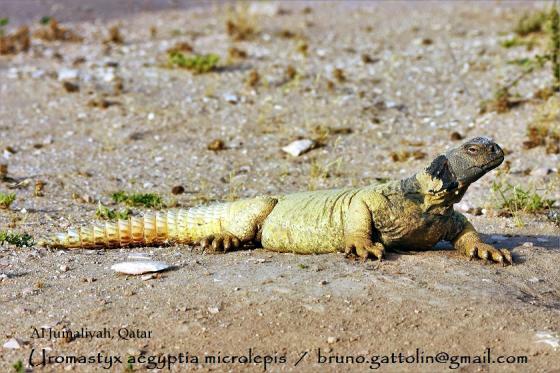 Diagnosis Original definition (genus): Cauda squamis magnis crassis aculeatis verticillata” (Tail annulated by large, thick and spiny scales) (MERREM1820). Note that this definition appears to be the new definition by WILMS et al. 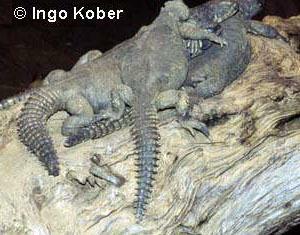 (2009) excluding the new genus Saara. 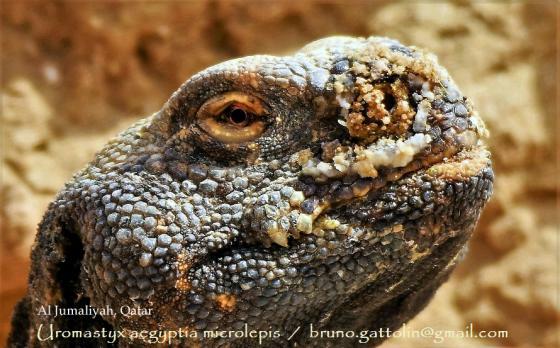 Diagnosis (genus Uromastyx s. str. ): Acrodont dentition, with the premaxillary bone forming in adult specimens a sharp, tooth- like structure replacing the incisive teeth. 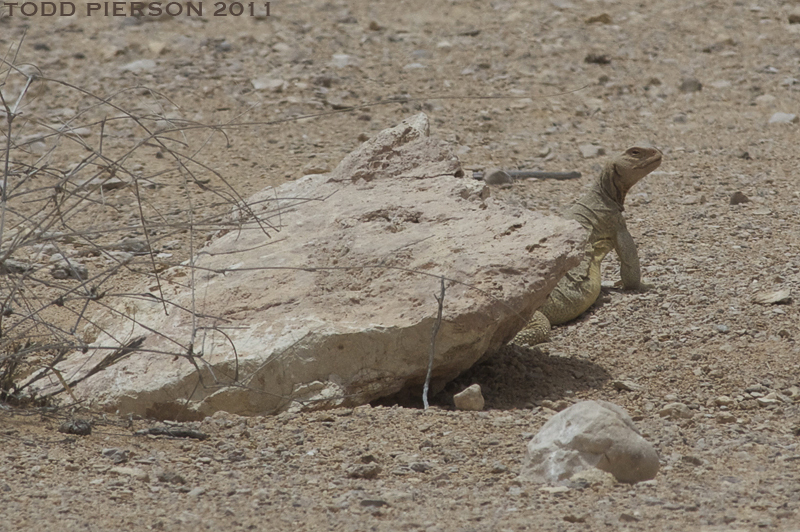 Tail scalation arranged in distinct whorls, which are not separated by intercalary scales dorsally. 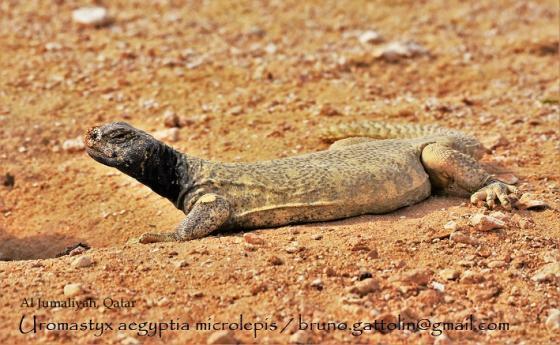 Differential diagnosis (species): U. aegyptia is distinguished from U. thomasi and U. princeps by the longer tail (60.18–102.83 % of SVL in U. aegyptia vs. 25.00–36.16 % in U. thomasi and 34.62–52.55 % in U. princeps); from the species of the U. ocellata group and from U. macfadyeni by the arrangement of the annuli of the tail: last 8–21 forming a continuous scale row each (U. ocellata group and U. macfadyeni) vs. 2–8 whorls forming a continuous scale row in U. aegyptia; from the species of the U. acanthinura group by more scales around midbody (238–322 in U. aegyptia vs. 142–231 in the species of the U. acanthinura group). U. aegyptia is distinguished from U. occidentalis by having preanofemoral pores. 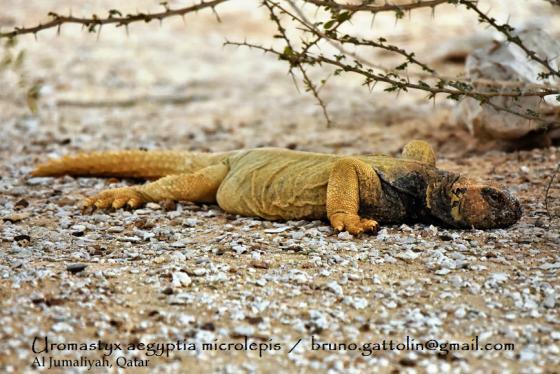 Differential diagnosis (aegyptia): The nominotypic subspecies is distinguished from U. a. microlepisby having enlarged tubercular scales scattered over the scalation of the flanks and by lower scale counts. It is distinguished from U. a. leptieniby a different juvenile colour pattern and a high- er number of ventrals (see WILMS& BÖHME2000 a). 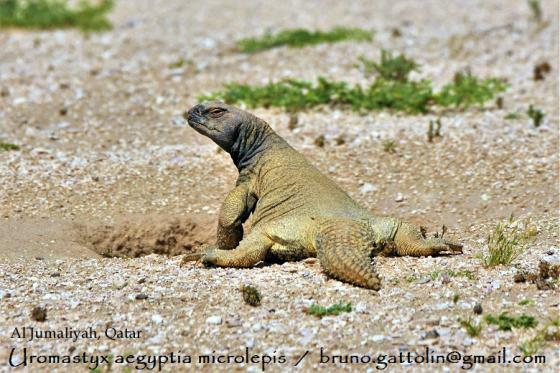 Differential diagnosis (leptieni): Uromastyx a. leptieni is distinguished from aegyptiaand microlepisby a different juvenile colour pattern and a lower number of ventrals (see WILMS & BÖHME 2000 a). 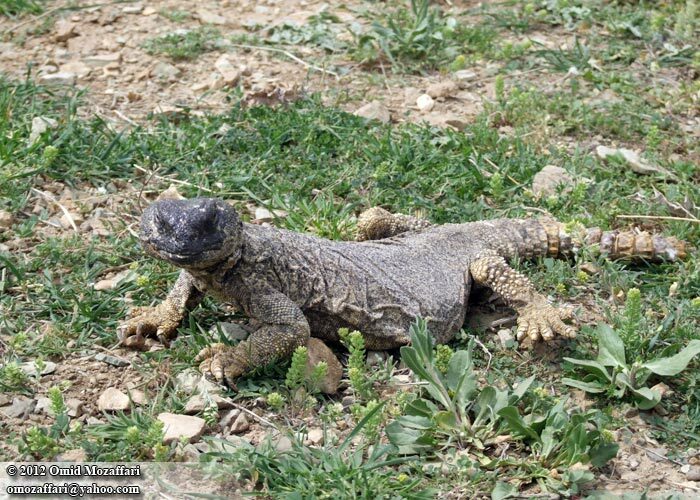 Differential diagnosis (microlepis): Uromastyx a. microlepis is distinguished from U. a. aegyptia by lacking enlarged tubercular scales scattered over the scalation of the flanks and by smaller scales. It is distinguished from U. a. leptieni by a different juvenile colour pattern and a higher number of ventrals (see WILMS & BÖHME 2000 a). 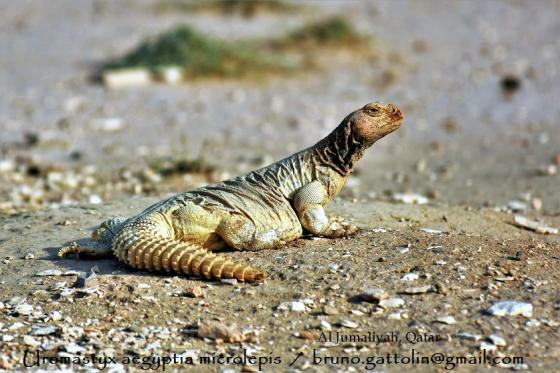 Comment One of the largest species of the genus with a total length of up to 76 cm. 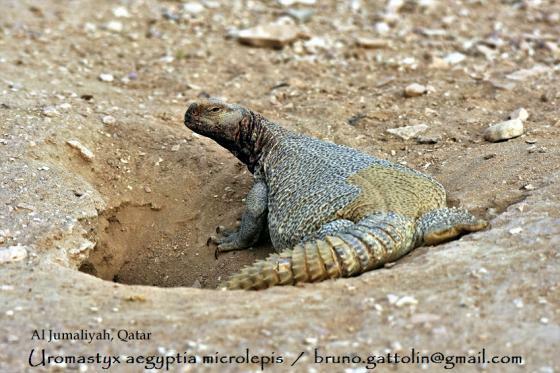 Distribution: not in Libya fide Bauer et al. 2017. See map in SMID et al. 2014 for distribution in Iran. 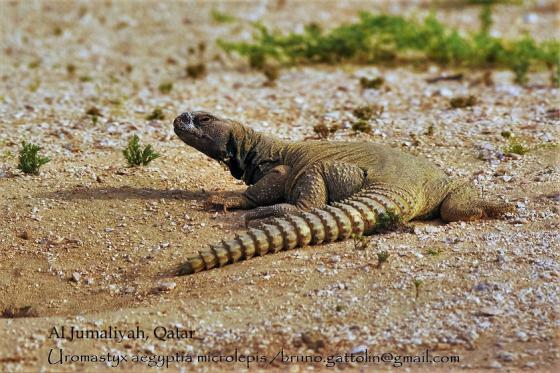 Type species: Stellio spinipes DAUDIN 1802 (= Uromastyx aegyptia) is the type species of the genus Uromastyx MERREM 1820. Etymology Named after its distribution in Egypt. Daudin 1802. 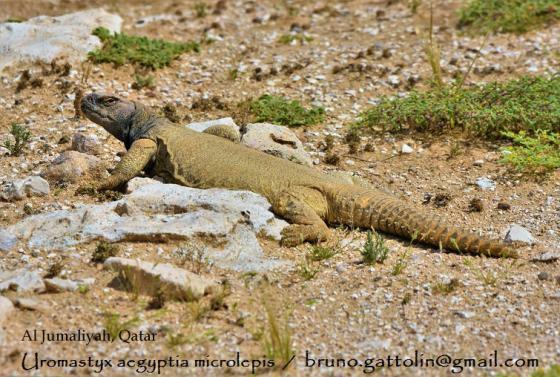 Histoire Naturelle, Générale et Particulière des Reptiles, Vol. 4. F. Dufart, Paris. El-Toubi, M.R. 1945. 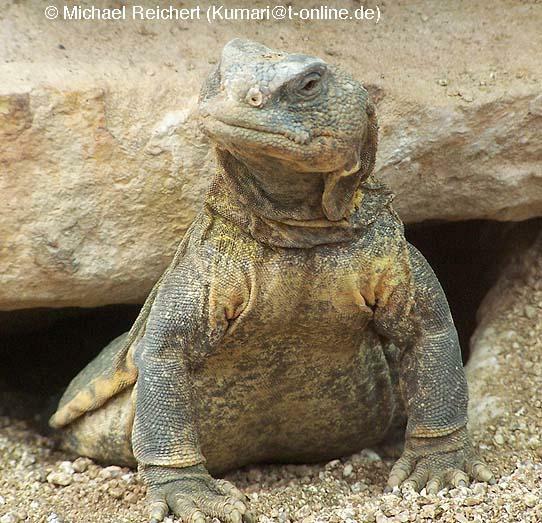 Notes on the cranial osteology of Uromastyx aegyptia (Forskal). Bull. Fac. Sci., Cairo. Fouad I University 25:1-10. El-Toubi, M.R. 1949. 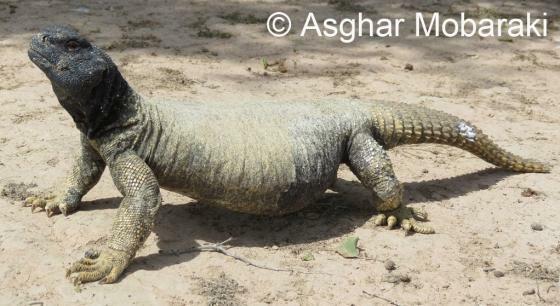 The post-cranial osteology of the lizard, Uromastyx aegyptia (Forskal). Journal of Morphology 84(2): 281-292. Joger,U. 1987. 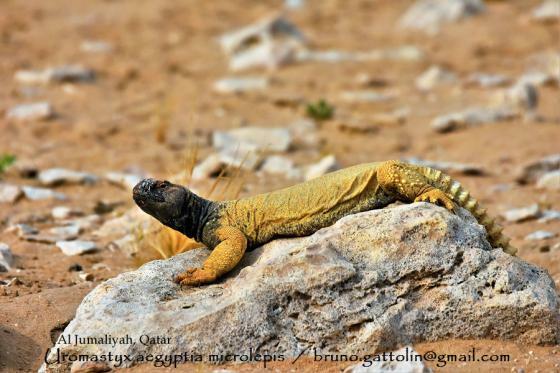 An interpetation of reptile zoogeography in Arabia, with special reference to Arabian herpetofaunal relations with Africa. In: Krupp,F., Schneider,W. & Kinzelbach,R. (eds. 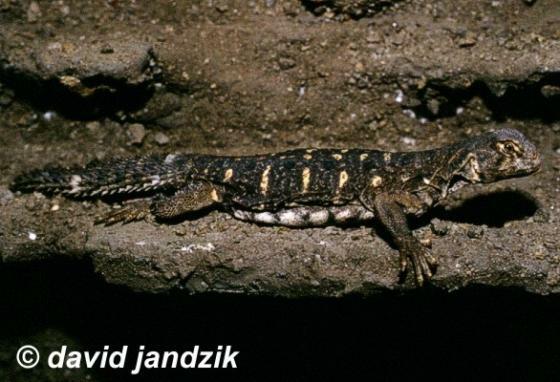 ): Proceedings of the symposium on the fauna and zoogeography of the Middle Eas Beihefte zum Tübinger Atlas des Vorderen Orients, A 28, Wiesbaden: 257-271.